Each team has a different colored jersey. The wall for each team has a gym mat in it, this is the “Cooler” for the opposing team. Six foam targets are placed at each end of the gym (inside of a hula hoop). It works best if the team with the blue jerseys are retrieving the blue targets, etc. The area between the wall and the endline is the designated safe area for opposing players attempting to retrieve their pin. Only one player from the opposing team may be in the safe area at a time. The Object of the Game: Players attempt to remove the pins from the opposing team’s endline and return them to their own endline. The Game is Over: when all of the pins have crossed the line and are in their team’s safe zone. Students are safe on their own side. If a player crosses the center line they may be tagged by the opposing team. Tagged players are frozen until a teammate reaches them and grabs their hand. They both are allowed free walk-backs to their side, as long as they are holding hands and have their hands raised in the air. Players that reach the opposing team’s targets are safe as long as their hand is on the pin and they remain behind the line in the safe zone. If the player removes their hand from the targets, the opposing player may tag them and the target stays at that spot. The tagged player goes to the “Cooler”. As soon as the target leaves the safe zone line the player may be tagged. The target is set down at this spot. The player who was carrying the pin, then returns to their side. Only one player at a time may be in the safe zone. If two players are in the safe zone at the same time, they both must go to the “Cooler”. A player that is tagged while carrying a pin must set the target down at that spot and go to the “Cooler”. Targets may never be thrown. Start by setting the diabolo on the string and then on the floor to your right. Set the diabolo in front of your right foot, stand up and move to farther to the right if possible. 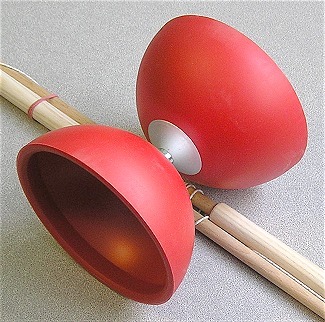 Before rolling the diabolo, stand pointing your sticks at the diabolo off to your left. The string should be hanging from sticks to diabolo. If not position the diabolo even farther right. Roll the diabolo across the floor in front of you. Start your roll slow, but accelerate faster as the diabolo moves left. As the diabolo reaches a point in front of you (before your left foot’s position); gently lift the diabolo up with both sticks. The diabolo should be spinning counterclockwise. Try to center the diabolo and begin to pull harder with the Right handstick. Practice goals are to reach a medium speed without causing the diabolo to swing wildly after the pickup. Once you know how to get the diabolo spinning, the next problem is to keep it from tilting. If the diabolo’s near cup is tilted down toward you, put your right stick forward. You can keep pulling with your stick forward to keep your speed up as you correct. If the diabolo’s near cup is tilted up toward you, put your right stick back. You can keep pulling with your stick back to keep your speed up as you correct. FITNESSGRAM: is the national fitness test battery for youth. The assessment includes a variety of health-related physical fitness tests designed to assess cardiovascular fitness, muscle strength, muscular endurance, flexibility, and body composition. Personal fitness self-testing is considered to be the principal use for FITNESSGRAM test items. Students are encouraged to do their personal best and improve their “PR” on subsequent tests during each school year. Pacer: The Pacer running test is administered in the gym. Students run from one end of the gym to the other (20m) at the pace of the CD. Students are allowed one lap to catch up if they fall behind the beep sound that designates the time allotted to for each lap. When a student does not make the lap in time, their test is over. pacer runner’s grid.xls Rather than have the whole class run at the same time, students pair up and tally for their partner on this sheet. One partner lines up at the starting line, while the other partner sits at the side of the gym and puts a line through each number as laps are completed. Twenty pins are lined up on the black lines in front of the opposing walls. It works best to pick a couple of students to begin setting up the targets while the rules are covered and the teams set. Break class into two teams. In our gym we have four teams (red, blue, yellow, green). So it’s pretty easy to put two teams on each side. Each team has twenty pins that are defended by goalies on their team. Players sit in front of their targets and wait for the music to start to begin the game. The object of the game is to knock down all of the targets on the opposite side of the gym. The balls may be thrown or kicked, depending on which game you’re playing. When a targets is knocked down, it works best if it is immediately put into the container that it came from. Note: For K,1,2 they often choose to put the targets back up. Players may switch on their team between protecting the targets and throwing at the other team’s targets. Switch ends of the gym after all targets are knocked down. A variety of balls and other objects can be used. Doing a bounce pass with a basketball is a good place to start. Students are spaced out around a square grid such as a four square floor design. Team of players are set up at the corners and lines outside of a four square floor design. For larger groups everyone will need to take a step or two back to accommodate everyone. The second player passes the ball to someone across from them. This continues until everyone has the ball at least one turn. It is important to remember who passes you the ball and who you will be passing to. To learn names, you can also have students call out the name of the person they are passing to. After your team can successfully pass the ball in a continuous fashion, the starter may add another ball. Additional balls can continue to be added as long as the team is successful. Tip for Success: Do not watch the ball – watch the person that passes you the ball. Blindfolds for half of the class. Form partners – one has a blindfold on. Gym is set up with cones, hula hoops, dome cones, etc. The other partner is the body guard. The object of this activity is for the “body guard” to safely navigate their blindfolded partner through the obstacle course only using verbal commands. After a short period of time, switch places so each partner has a turn being blindfolded. Form partners: One is the horse, the other is the rider. The partner that wears the blindfold to start is the horse. They hold the middle of the rope in front of them. After a short time the partners should switch places. 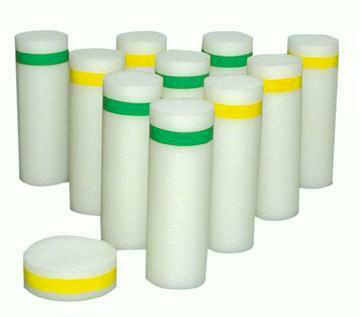 Soft throwing balls (yarn balls). One soft throwing ball (yarn ball)for blindfolded partner. Start the game with balls spread around on the floor, so commands must be given to pick up a ball. The object of the game is for the “body guard” to direct their partner to a ball, get them to pick it up and throw it at another blindfolded player. This can only be done with verbal directions. The “bodyguard” is not able help their partner except with verbal directions. They may not block throws. (For safety reasons, body guards may intervene to prevent player from bumping into each other). Partners switch roles when their player is tagged by a ball. Cones spread out in front of walls, so students move in a circle. Students spread out in the gym in a large circle. Teacher says,”Pilots, start your engines”. Students spread out their arms with one knee on the floor. Teacher says,” Fasten your seatbelts and prepare, for takeoff”. Students fasten seatbelts and begin to slowly walk a bit faster. Students glide their arms through the air, while jogging. Teacher says, “Prepare for landing”. Students begin to slow down and lower their arms. Teacher says,” Wheels on the ground”. Students slow down and come to a complete stop. Place your thumb on top of the disc, and your index finger on the outside edge. Curl your other fingers under the rim, and grip firmly. Point your throwing elbow at your target, and step toward the target with your front foot. Extend your arm, and snap your wrist as you release, pointing at the target. Hold hands out in front of you, one above and one below. 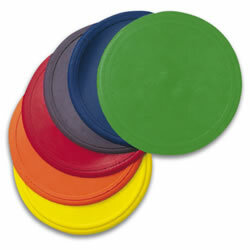 As the disc comes into your hands, “clap” it between them. Keep your eyes on the disc as it comes into your hands. Both hands in front; palms out; thumbs down. Bring your fingers to your thumb as disc hits hand. Use the two hand catch when you can. One hand in front; palm out. Higher than waist; turn your thumb down. Lower than your waist; your thumb is on top. Bring your fingers to your thumb as the disc hits your hand. As the disc nears, lift 1 leg high enough for the disc to fly under. Catch with 1 hand behind your leg. Throwing arm out to the side, away from your body. Hold your thumb under the front side of the rim. Bring your throwing elbow to your hip. Keep the disc parallel to the ground.